In recent years we’ve seen a fall in insurance claims for theft of motorhomes amongst our customers. Unfortunately the same cannot be said for the theft of items from motorhomes, which make up one of our largest areas of claim. However there are some simple precautions which motorhomers can take in order to better protect their equipment and belongings and reduce the risk of theft, whether your motorhome is in storage, on a campsite, or on the road. In general caravan sites and campsites are very safe places to be and the risk of theft is certainly not any higher than elsewhere. However some campsites are more secure than others, so if you are on a site with open access or no entrance gate or barrier then take extra care when looking after your equipment and belongings. Try not to leave items on view in an unattended motorhome and always lock your motorhome even if you are only leaving it for a few minutes on campsite. It only takes a matter of seconds for a thief to gain access to an unlocked van and steal small valuable items. An audible alarm can also be a useful tool in combating theft on campsites. A loud siren is sure to get the attention of neighbouring campers and scare off would-be thieves. When your motorhome is not in use, whether at home or on a storage site, then wherever possible you should remove any valuable items such as TVs and electrical equipment and store these safely in your house. If all valuable items have been removed from the ‘van then you can leave the curtains open to show that there is nothing worth stealing inside, should a would-be thief start looking around. If you have an alarm or tracking device fitted to your motorhome then it’s extremely important you check the battery which powers them is fully charged and in good working order. Some tracking devices will even send out an alert when the battery power is about to run out, allowing you to replace or recharge it before your vehicle becomes unprotected. Security is often the last thing on your mind when pulling your motorhome into a service station, or stopping at the roadside, but it’s important that you never leave your motorhome unlocked, even for a minute, as it only takes seconds for a thief to gain access and steal valuables. Motorhome security which is quick to engage, such as alarms and trackers can also be turned on when you stop with your motorhome to give added security at the push of a button, and further peace of mind that your belongings are safe. A proactive tracking device can be useful at thwarting break in thefts thanks to the trigger of motion sensors or an alarm that links to the tracking device, which then sends a signal to the tracker’s monitoring centre telling them someone is breaking in. Police can then be alerted and the thieves can be caught red handed. When theft occurs what’s covered by insurance? Of course sometimes theft is unavoidable and that’s why a specialist motorhome insurance policy is vital to cover your motorhome specific items of equipment. For policies taken out or renewed pre April 1st 2014, Caravan Guard’s motorhome insurance cover includes a sum of £3000 cover for motorhome equipment including awnings, pots and pans, TV’s, generators etc. (Cover levels, terms and conditions apply – see our motorhome policy wording). Please note that personal items that you take from your home on motorhoming trips such as clothing are not covered under Caravan Guard’s pre April 2014 motorhome policy – these are usually insured under your home insurance policy. Also remember that ‘high risk’ items such as mobile phones, cameras, watches, jewellery, mp3 players, iPods and bicycles are generally not covered under a motorhome policy and should be insured elsewhere and looked after with extra care. Update June 2014. Please note policies taken out or renewed after 1st April 2014 now include £5000 cover for motorhome equipment and personal possessions such as clothing. 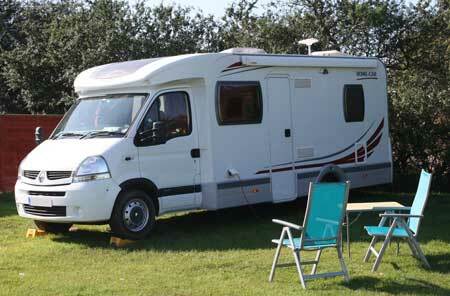 For further information visit our benefits of motorhome insurance page. High risk items such as bicycles and tablets can also now be covered on Caravan Guard’s separate Gadget and Leisure equipment insurance policy. We have a Peugeot Boxer based motorhome (2004 shape) and tried to buy secondary cab door locks, but none were available. As an alternative we use a 300kg ratchet strap between the internal door handles. It makes the doors impossible to open even if the locks are compromised. You can still rotate the front seats as normal. In case of an emergency we have a seat belt cutter on the dashboard when we are “at home”. Hope this is helpful. We were also broken in to in Italy, firstly in Milan and secondly in Pisa, the Ducatto lock is simply forced with a screwdriver in a way that triggers the central locking. Our best buy was a £50 Yale safe bolted to the floor and wall of our wardrobe. Wallets, passports, cash, iPhone, iPad et al live in the safe and were untouched. The thieves were left to steal odds and ends that had some monetary value but no personal value at all. Touring Italy we now assume theft is likely and travel with this in mind. A cautionary tale. In May we visited, Pompeii, Rome, Pisa and places in between. On our last night we stayed on an Aire in Sportono. We paid €13 and were surrounded by 20/30 other Motorhomes. We went to bed as usual, locking all the doors and engaging the alarm.It rained very hard until 3am. The following morning my husband could not understand why when he disengaged the locks nothing happened. We soon realised that the drivers door was open, the lock forced, we had been broken into during the night but had not heard a thing . Strange because I am a very light sleeper. The thief had obviously been in the van for some time because a number of items, including cameras and sat nav, that were not on show,had been taken. A very helpful Italian Motorhomer took my husband too the police station, at least to report the incident and obtain a report. We had heard the stories on the motor homing community but you never think it will happen to you, but it does. We thought we had done enough, obviously not. We have since had security locks put on the inside of both doors and a lock on the habitation door. The moral is do as much as you can to ensure the safety of yourself and your belongings. It hasn’t put us off but it was very upsetting. Hi Linda and Colin, thanks for getting in touch. That is such a shame but at least with the security locks in place you can be sure that it won’t happen again! We offer a number of premium discounts for extra security if you want to take a look here for details. Thanks again! Just finished reading your motorhome security article, very informative ! it’s reassuring to know we’re doing it all right at the moment; but I must add it makes a big difference to your peace of mind when you’ve got a Dobermann sat looking out through your windows !